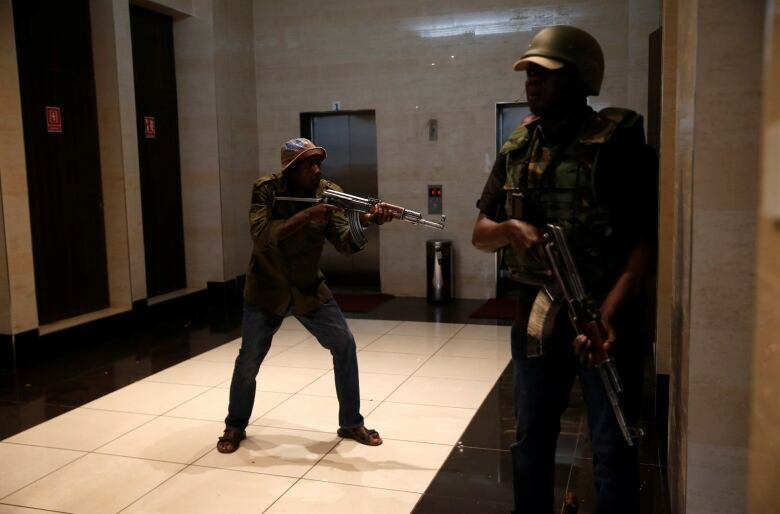 There are indications an attack on a Nairobi hotel may not be over. More than 12 hours after the initial explosions and gunfire, a first responder reported renewed gunfire and explosions coming from the complex. 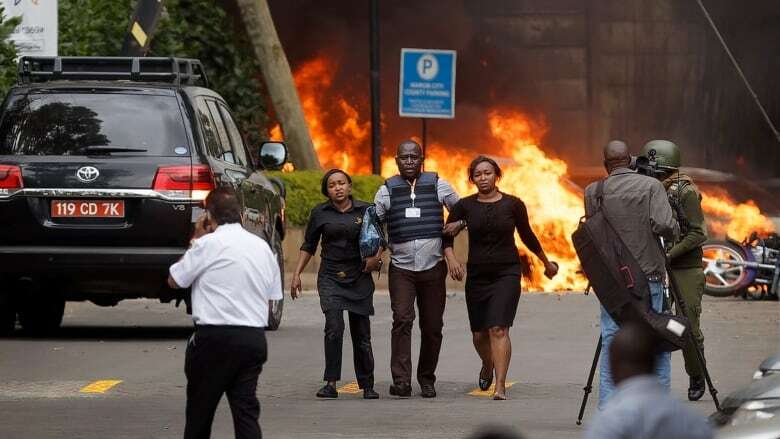 There are indications an attack on a hotel in Kenya's captial may not be over. 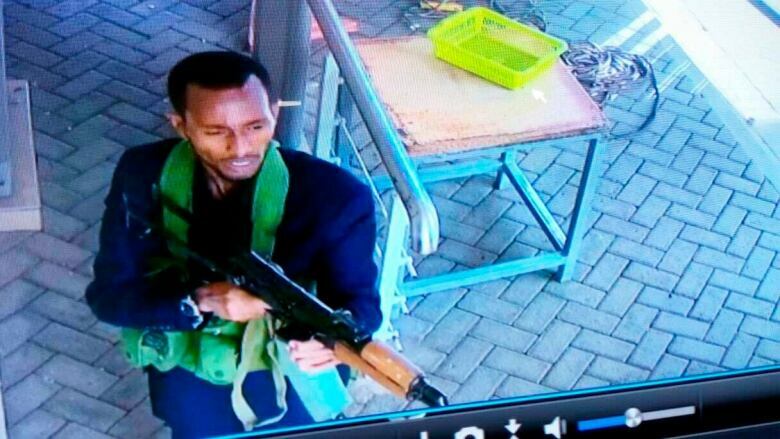 More than 12 hours after the initial explosions and gunfire Tuesday, a first responder reported renewed gunfire and explosions coming from the Nairobi complex. 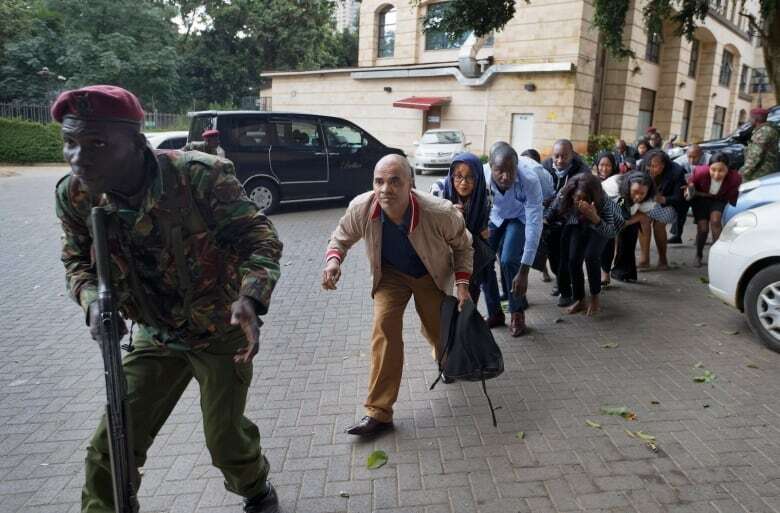 Extremists initially attacked a luxury hotel Tuesday afternoon local time, sending people fleeing in panic as explosions and heavy gunfire reverberated through the complex and black smoke rose over the scene. Surveillance video showed three attackers dressed in black running across the parking lot at 3:30 p.m., shortly followed by a fourth. At least two of the men were wearing green scarves in the close-up footage. One appeared to be wearing a green belt with grenades on it. 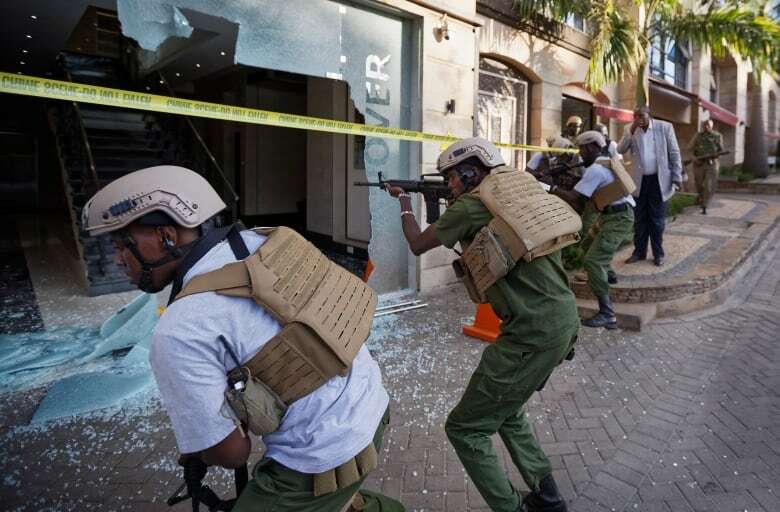 Al-Shabaab — the Somalia-based extremist group that carried out the 2013 Westgate Mall attack in Nairobi that left 67 people dead — claimed responsibility. "It is terrible. What I have seen is terrible. I have seen a human as I ran out, and there is what looks like minced meat all over," said one man who said he ran from the scene, Charles Njenga. He did not give details. About eight hours after the siege began, Interior Minister Fred Matian'i said that all of the buildings affected by the attack had been secured and that security forces were mopping up. He said many more wounded remained trapped inside. A witness who gave his name only as Ken said he saw five bodies at the hotel entrance during the attack. He said that other people were shouting for help and "when we rushed back to try to rescue them, gunshots started coming from upstairs, and we had to duck, because they were targeting us and we could see two guys shooting." ​Kenyan hospitals appealed for blood donations even as the number of wounded remained unclear. Simon Crump, an Australian who has lived in Kenya for five years, told CBC's As It Happens he didn't know if it was safe to run outside when the violence broke out, so instead he and two colleagues barricaded themselves in his office and waited for things to subside. They couldn't see anything, because they were on the side of the building facing away from the chaos. "You'd hear footsteps above, you'd hear other things, other people moving around in the building," said Crump. "And it's quite nerve-racking, because you just don't know whether the noises you're hearing, whether it's people, whether it's police, whether it's terrorists, you just don't know what those noises are." Other survivors closer to the where the attackers rampaged reported hearing a shattering blast and saw people mowed down by gunmen as they sat at a cafe. Victims were left lying on tables, bleeding. 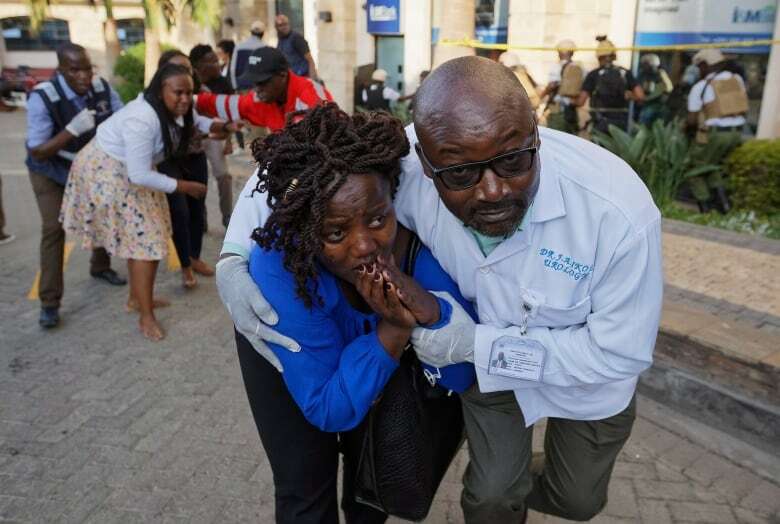 "We were changing our shifts, and that is when I heard a loud blast and people were screaming," said Enoch Kibet, who works as a cleaner at the cafe and managed to crawl out of a gate in the basement. "I couldn't believe I was alive. The blast was so loud and shook the whole complex." Crump said gunfire could still be heard as him and his colleagues eventually evacuated. "I don't know where those shots were coming from or who they were coming from, but as we were leaving it was definitely still much still very much active shooters around," he said. Al-Shabaab has vowed retribution against Kenya for sending troops to Somalia since 2011. The al-Qaeda-linked group has killed hundreds of people in Kenya, which has been targeted more than any other of the six countries providing troops to an African Union force in Somalia. The hotel complex in Nairobi's Westlands neighborhood is less than two kilometres from Westgate Mall and lies on a relatively quiet, tree-lined road in what is considered one of the most secure areas of the city. The hotel's website says it is "cocooned away from the hustle and bustle in a secure and peaceful haven." "I've been here five years, and obviously you're aware of the security issues and the fact that hotels and corporate office blocks and shopping centres are high targets, but I think we've had a false sense of security," said Crump. 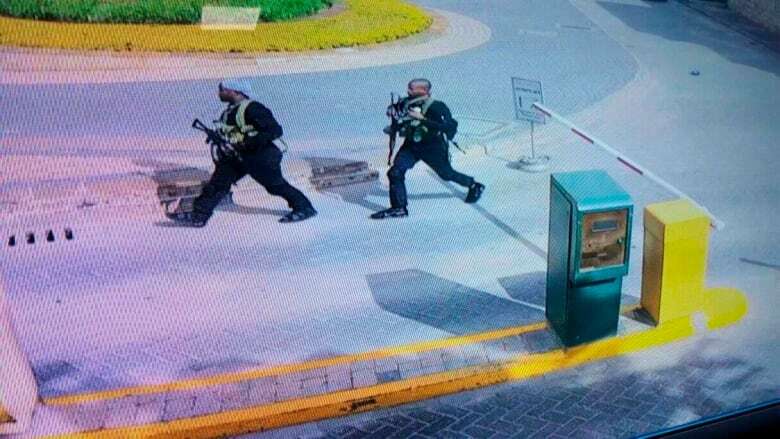 On Monday, a magistrate ruled that three men must stand trial on charges they were involved in the Westgate Mall siege. A fourth suspect was freed for lack of evidence. 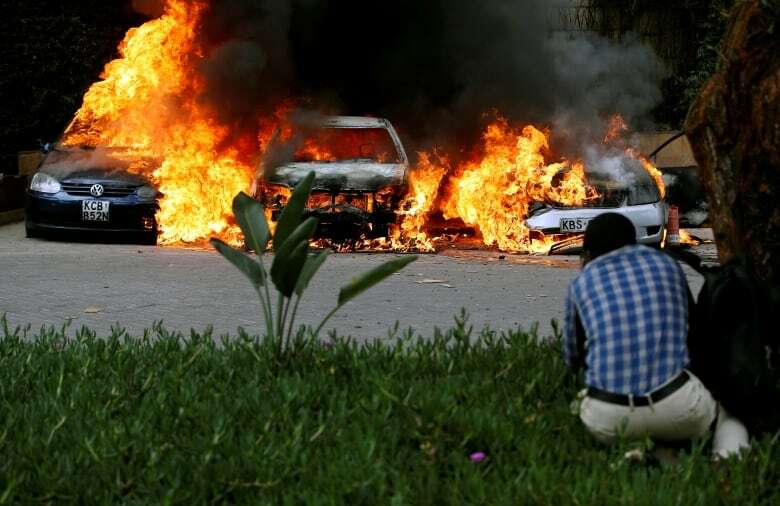 The attack on Tuesday came three years to the day after al-Shabaab extremists attacked a Kenyan military base in neighbouring Somalia, killing scores of people.